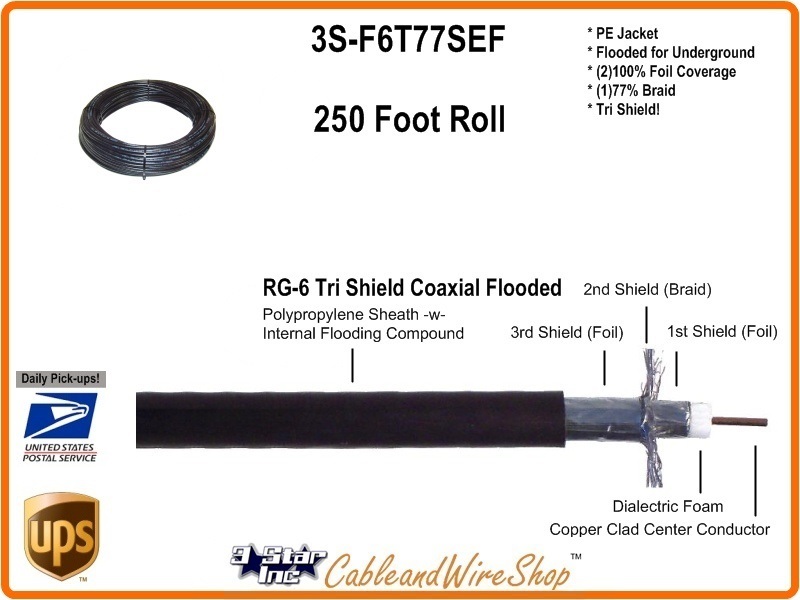 This is Tri-Shield RG6 cable to Use for Underground Applications between Buildings, Homes and Satellite or HDTV Antennas in a 250 foot Length for complete Projects from Satellite Dish, Cable TV and Antenna Installations to the Home. This Cable Features a PE (Poly Ethylene) Jacket with Moisture Resistant Flooding Compound over Two layers of Bonded Foil and 77% Braid, Bonded Foam Dialectric with a Copper Clad Steel Center Conductor. Perfect for HDTV, DTV, Cable TV, Master Antenna and Satellite Master antenna Applications with 2.2 GHz Bandwidth. Can Also be Utilized Between Telephone poles, Satellite Dishes, Towers and Receiving Equipment, and from Building to Building Underground. Just Don't Use it all on One Run (Read the Spec. Sheet for Loss Information)!!! This is an Economical 250 foot Coil of Commercial Grade Low Loss Cable your local Installation Professionals use in your MHP Hotel Motel SMATV Satellite TV, Cable TV, Security Camera and High Speed Internet Systems to distribute in short run segments of 150 feet or greater with an Amplifier. Mobile Home Parks- Where they are Administrating their own Cable TV or SMATV System with Underground Outside Plant running along the same easement that Telephone and Power runs past each Lot. UG Installation is a little more expensive to install, but is more asthetically pleasing. In the same Conduits and Trench-lines, Modulated Security Camera feeds run through this cable, each independantly from a camera to a Central Location for further processing and recording. Once processed and combined as TV channels along with the others offered, they distribute these Camera Feeds for residents to monitor their guests and service appointments arrivals and departures, sharing the Security Responsibility with all. Small Apartment, Condominium, Hotel and Motel Complexes not only use this cable for Strategically placed Security Camera Feeds from Entry point locations, but as a means of MATV Antenna Installation, distributing their own Signal to meat up at the same Lock-boxes that serve as central location connections to the units inside. Where the managers of the Property may have provided Cable TV or Satellite (SMATV) systems on the Properties, some Tenants may not be able to afford it, having an alternate feed those residents opting for Free Off-Air TV beats having several located on the Balconies. Antenna Reception may not be equal at any location on the Property, and only one or several locations my be deemed sufficient in Signal Quality or Asthetics concerns. Building to Building Coaxial Cable Feeds run underground may be the answer as it will serve to maintain the Codes and Policies in place without necessity of deviation or waiver. The same Antenna location issues are faced by Home Property owners Large and Small. There may be only one location not blocked by Trees or other buildings to locate the Antenna, and of course, the signal is needed some place else. Again, Underground Placement of Coaxial Cable in Conduit is a path that can be revisited and up-graded by simply pulling out the Old and pulling in the New.